BC Racing ZR Series Coilovers bring a 3-way adjustable track ready coilover system to racers from novice to pro for an affordable price that has never been seen in the industry. Each ZR Series Coilover system offers independent low speed/high speed compression adjustments and separate rebound adjustment. They also offer full height adjustability independent of piston travel and spring preload. For cars with McPherson struts the ZR Series comes standard with an inverted mono-tube damper with the steel braided Teflon coated line exiting the top of the damper to the external reservoirs that can be remotely mounted on the chassis for easy adjustment. 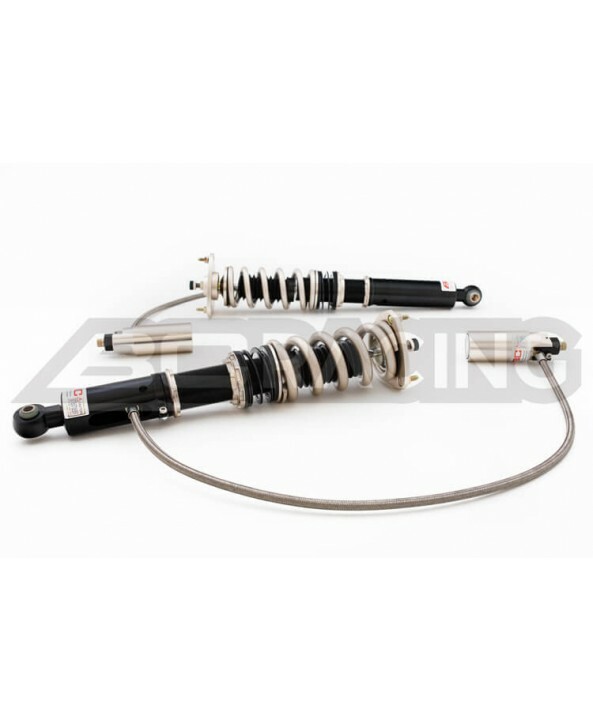 Cars with double A-arm suspension come with upright dampers with steel braided Teflon coated lines or solid stem that exit the damper at the bottom and lead to the external reservoir that can be mounted under the chassis or on the shock body itself. They offer 30-clicks of rebound adjustment, 15-clicks of low speed compression adjustment, and 12-clicks of high speed compression. The BC Racing ZR Series Coilover comes standard with Swift Springs.